Ross Tinker has shared these pics of his unique, 1983 Hot Rock twin fin, shaped by Mickey Mac whose real name is Chris McHarn. 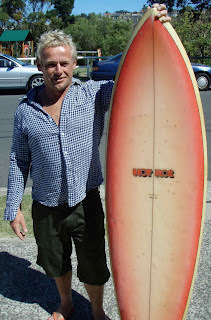 According to Ross , he started shaping his own boards under the Hot Rock label after leaving Bennett's. He says, "I am not too sure how many he produced over the years but I haven't seen many others. 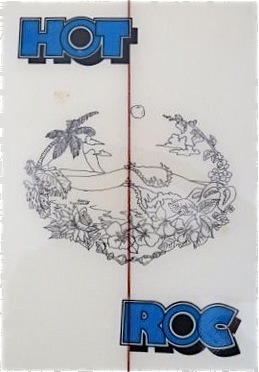 This board was a custom for Peter "Benno" Bennett, no relation to Barry. 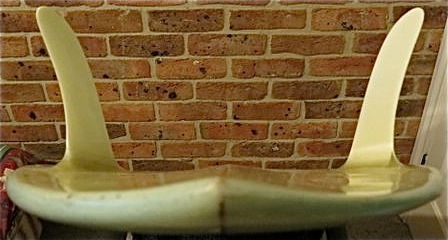 It's 6'4"x 20" with two massive bonzer style channels in the tail. 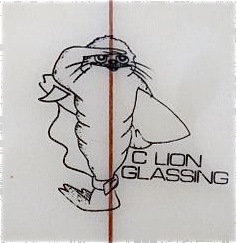 The hand drawn decal I believe was created by his partner at the time." Simon with Hot Roc single fin.